Sky watchers in North America can spot the ISS and the space shuttle Atlantis at the same time on Oct. 16 and 17. October 16, 2002: It's not every night you get to see a spaceship fly over your back yard. This week you can see two. The International Space Station (ISS) and the space shuttle Atlantis will soar over North America after sunset on Oct. 16th and again on the 17th. It's perfect timing for sky watchers. Light from the setting sun will glint off the two spacecraft and make them easy to spot. Above: Using an 8-inch telescope and an inexpensive digital camera, Tom Gwilym of Bellevue, Washington, captured these images of the ISS and the space shuttle docked together on Oct. 13th. Just this morning Atlantis undocked from the space station--the end of its 9-day visit to the ISS. The single point of light which in recent days had been the two spaceships joined together has now split in two. Until Atlantis lands on Oct. 18th, the shuttle will follow an orbit similar to the space station's. This means you can see both spaceships at the same time (or nearly so) as they pass overhead in tandem. Peering at the ISS through a telescope can be a wonderful experience. (Amateur astronomer Ulrich Beinert explains how to do it in the Science@NASA story "More Spaceship Sightings.") 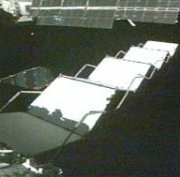 The space station's T-shaped solar arrays are eye-catching, and many sky watchers are impressed by their eerie copper color. You don't, however, need a telescope to enjoy these flybys. The station will be very bright and easy to see with the unaided eye. When exactly should you look? Find out by visiting one of these three popular web sites: J-Pass, Heavens Above, or SkyWatch. Each will ask for your zip code or city, and respond with a schedule of suggested spotting times. Times for selected US cities are listed in the table below. It's a partial list. If your home town is not included, check the web sites for more information. Above: Local times in October when the ISS will appear over some U.S. cities. The station will emerge over the northwest horizon, sail overhead (or nearly so), and disappear again in the southeast. A typical apparition looks like this: The space station appears near the horizon. At first it's just a dim speck of light, but it brightens as it glides overhead, crossing the sky in 3 to 6 minutes. When the geometry is right, as it will be for many sky watchers on Oct. 16th and 17th, the ISS outshines every star in the sky except the sun. Although the space shuttle is smaller than the ISS, it will shine brighter than the ISS during the coming flybys. Why? The shuttle's white surface is an excellent reflector of sunlight. The two brilliant spacecraft will appear close together on Oct. 16th, but farther apart on the 17th as Atlantis prepares to land. Heavens Above calculates sighting times for the ISS and the shuttle. Check both before you head outdoors. The crew of the Atlantis have been working at the ISS this past week on a construction mission. They delivered and installed the S1-truss, a 45-foot-long extension to the station's "backbone." Attached to the S1-truss is a radiator, silvery and reflective, which itself unfolds 75-ft long. Every time such pieces are added to the expanding station, it becomes easier to see. That's good news for sky watchers because the ISS soaring overhead is a lovely sight. The space shuttle flying nearby only makes it better. Check the flyby schedule for your hometown and see for yourself! NASA's Human Spaceflight -- (SpaceFlight.nasa.gov) Up-to-date information about the space shuttle and the International Space Station. A helpful hint: Web sites like Heavens Above will give you a list of spotting times for your hometown. Usually its a long list. Which times should you choose? The best apparitions are the ones with negative magnitudes. The astronomical brightness scale works like this: A 1st magnitude star is bright. A -1st magnitude star is much brighter. The more negative the better. The magnitude of the Sun, for example, is -26. try looking for the ISS anytime its magnitude is less than zero. What makes the ISS shine? There are no bright lights on the outside of the space station. The ISS shines by reflecting sunlight, as much as 90% of the light that hits it. Much of the ship is light-colored. Even the awesome solar arrays, which must absorb sunlight to power the station, aren't completely black. Their reflectivity is near 35%. What is a "truss?" -- from spaceflight.nasa.gov, includes an interactive diagram of the space station's growing infrastructure.